There is no denying that the image of hunting has changed over the last 30 years. Despite many changes during this time one thing has remained the same, Ronnie "Cuz" Strickland. 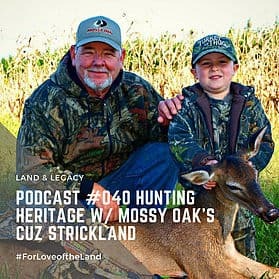 This man's devotion to the hunting heritage and support of ALL hunters has been undeniable. Cuz's genuine hunting stories will draw you in and encourage you as a hunter. Be proud to call yourself a hunter! Recently, Cuz has joined the Board of Directors with the Quality Deer Management Association to further advance the mission of preserving the hunting heritage. The union of Mossy Oak and the QDMA has put our hunting heritage in great hands. We hope this podcast will inspire and encourage you to take a stand with us. The outdoors is a gift, helps us pass it on! Enjoy. Learn. Share! #ForLoveoftheLand.